The game, it seems, is afoot. Let the wild life begin. 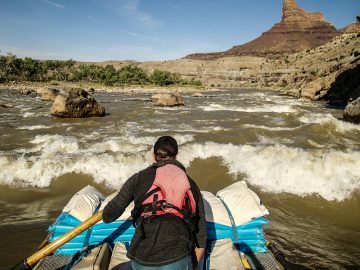 We (myself and 5 other adventurers, plus Danny and Ali, our trusted guides) are heading into Wyoming’s wilderness for a week of solitude, sea kayaking and scenery. Everyone else is a seasoned outdoor-person. 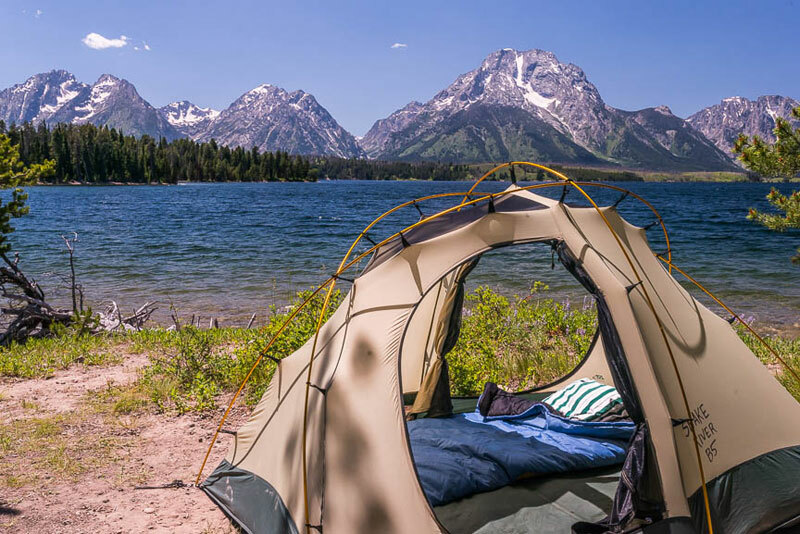 I, like Dave Barry, have always seen camping as nature’s way of promoting the motel industry. It promises to be an interesting week. Passing Isa Lake, I crane my neck in hopes of spotting more animals. Choked with yellow water lilies, the lake straddles the Continental Divide, draining into both the Atlantic and the Pacific. Conversation in the van is centered around bears, who’ve been appearing in the headlines with alarming regularity this summer. Ali assures us that she’s never lost a guest to a grizzly. I resolve not to be the first. The journey starts from the ground up at our arrival in Yellowstone. 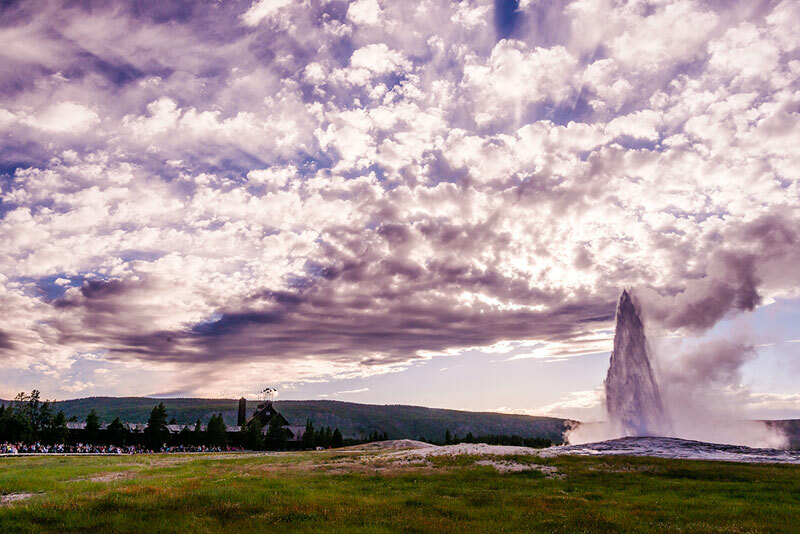 The ground, in this case, being Old Faithful, the most famous attraction in the world’s first national park. Wildfires engulfed much of the surrounding area in 1988. Charred trees near the sprawling Old Faithful Inn are a chilling reminder of how close the historic structure came to being destroyed. Danny and Ali direct us down the slippery boardwalk, away from the crowds queuing at the “front” of Old Faithful. Just a few hundred feet away, there’s an unobstructed view of the eruption. The air is thick with sulphur and a boy walks by holding his nose. A hawk poses haughtily on a fossilized tree. Hoof prints inside the barriers mark where elk and bison have broken through the brittle igneous rock. The earth’s crust here is thin, the molten magma closer to the surface than any other place on the planet. Dragonflies flit among the fumerols, their rust color matching the reddish iron oxide deposits. 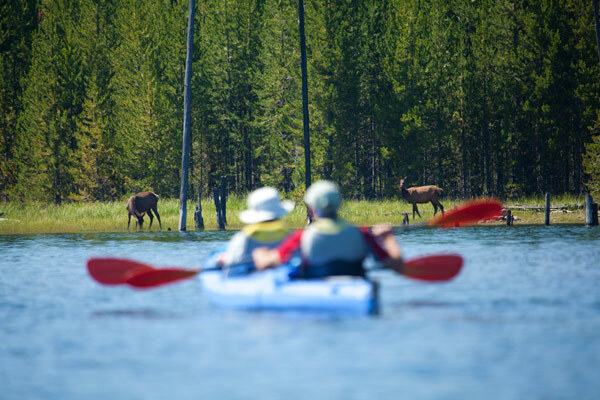 We bid goodbye to the geysers and head to Yellowstone Lake for a quick kayak introduction. 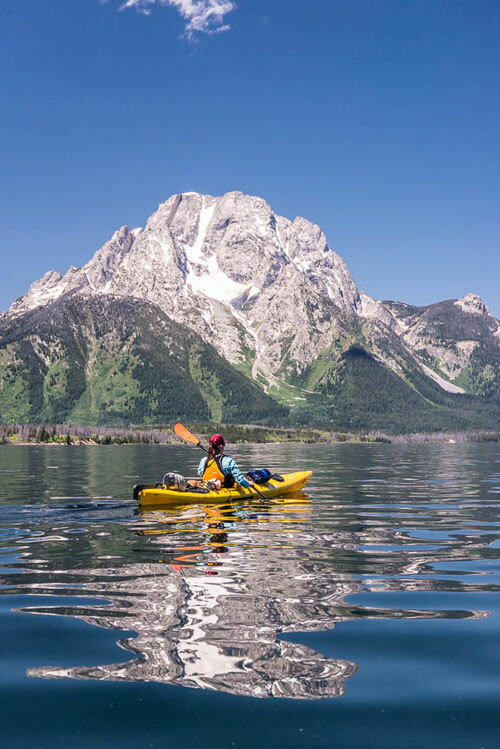 Nicknamed “divorce boats,” tandem sea kayaks are nonetheless known for their stability. But wind has whipped up 4-foot whitecaps on the lake, so the paddle is postponed in favor of a trip to geothermal paint pots. Rain clears the modest crowds, who stream back to their cars as we make our way along the jewel-toned craters. Mayflies flutter, making the most of their 24 hours of life. Mud ponds belch “bloop bloop.” If a dinosaur appeared in the midst of this landscape, no one would be surprised. And no one is more surprised than me the next morning. Danny’s cry of “Good morning, campers! We’ve got coffee! We’ve got cocoa! We’ve got teas from around the world!” rouses me from a sound sleep. We’d camped at Grant Village, only to be immediately joined by a young elk who stretched out behind us, making her bed in a patch of wild strawberries. After dinner around the fire—pork loin and asparagus—I’d settled my sleeping bag atop a thick foam pad and had a five-star slumber. Surprise! Refueled with bacon and blueberry pancakes, we make for Leeks Marina and make our first foray onto the water. Even in mid-August, the lake is numbingly cold, the kayaks’ stability reassuring. Ali heads off in the motorized support raft that holds our gear while we get to know the lake. 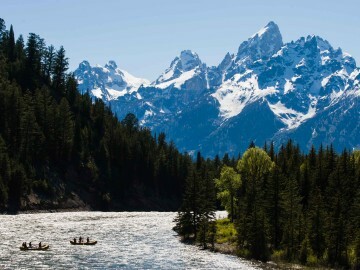 Soon paddling basics have been mastered, and we skim smoothly across the clear waters, under the watchful Tetons. 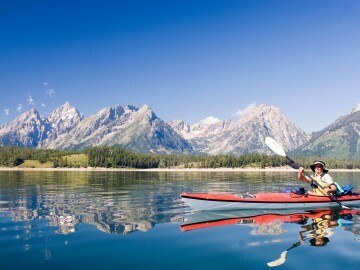 It’s like paddling in a postcard. Scenery: we’re soaking in it! 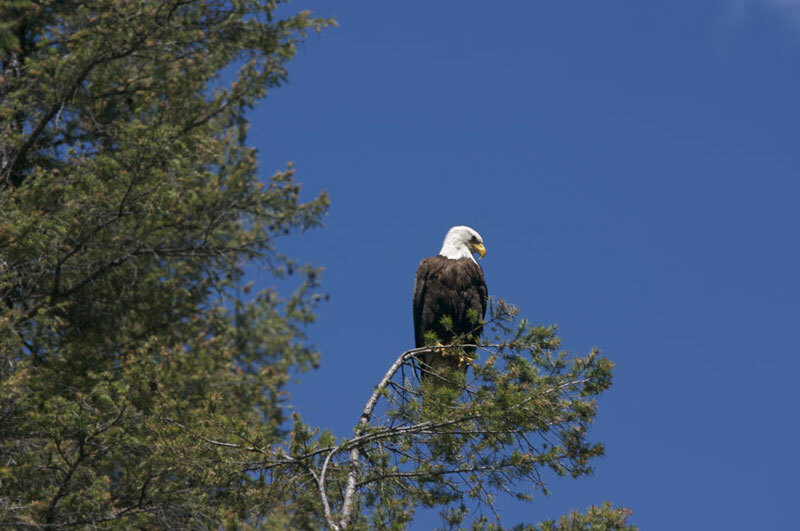 Two bald eagles monitor our approach to Colter Camp, on the lake’s western shore. We make camp in a flower-strewn clearing next to a small icy pond. After dinner, an animal approaches loudly through the brush. A small doe appears in the firelight. She circles the perimeter for most of the night, and well-guarded, I sleep. Morning comes with an osprey’s cry, and a hummingbird dive bombs the clearing as I’m folding the tent. The day’s paddle starts with a short detour north, where Ali guides us into the pond beside the campsite. A frigid stream burbles up to the surface. Heading south, glacier-fed waterfalls crash down to the lake. Ali stops and picks wild berries while telling tales of the area’s nature and history. Heading across Moran Bay to Grassy Island, the wind picks up and the waves rise. Fighting our way across the water we arrive at Grassy Island, our base for two nights. Danny makes hot tea and cocoa while we hastily erect tents. When the rain stops, we feast on steak and salmon while mosquitoes make a meal out of me. The group takes turns testing insect repellents, and soon they’re (mostly) repelled. 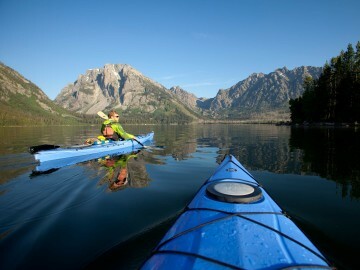 So far we’ve been traveling by paddle power, but the next morning it’s time to hike. Or bushwhack, actually, as Danny and Ali lead us up a steep trail that threads through dense undergrowth. I scramble over a freshly-fallen tree that is promptly named “Pants the Ripper.” A swift snowmelt-fed stream cascades besides the trail. This is prime bear territory (bearitory, if you will) so we make plenty of noise on the way to the summit. 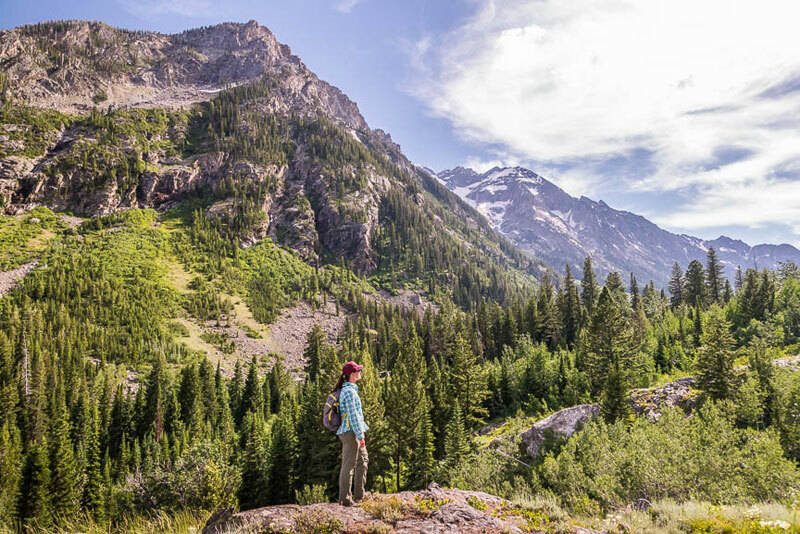 At the top, we’re rewarded with breathtaking views of the surrounding peaks. After lunch, a quick paddle through Bearpaw Bay brings us to a trailhead leading to Leigh Lake, where we spot our first humans. Ranger Philips comes from his cabin to tell us about the black bear and two cubs he’d spotted shortly after dawn. Leaving Leigh, we wander through a “Sound of Music” alpine meadow, laden with lupine and other alpine wildflowers, before returning to the island. Morning means saying goodbye to Grassy, as we head to the final campsite. 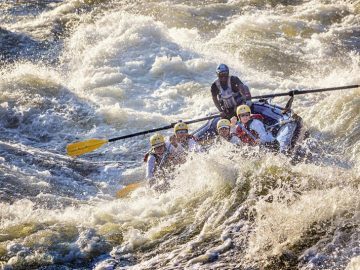 This essay was originally created for the 2012 OARS Adventures catalog. For more compelling stories from other renowned writers, request a copy of our latest catalog today! 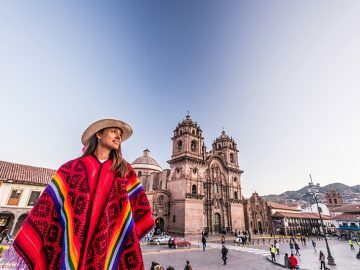 Cynthia Barnes has trekked to Timbuktu and Tibet, writing for National Geographic, Slate, Endless Vacation and other newspapers and magazines.